Here's an A-Z list of culinary terms for beginning cooks. Anyone just starting to learn their way around a kitchen will do well to know what these words mean. The au gratin method involves baking sliced potatoes or vegetables in a dish layered with cheese and a buttery topping of seasoned breadcrumbs. Au jus refers to a meat dish served with a sauce made from its own juices and fortified with stock and seasonings. Blanching is a cooking technique in which food, often vegetables, is briefly immersed in boiling water or fat, either to soften it, loosen its skin, or preserve its color. Boiling means to cook in a liquid that has reached its highest possible temperature of 212 F. A full boil is characterized by rapidly churning bubbles. Braising is a moist-heat technique for cooking meats and vegetables. The long, slow temperatures help tenderize tough cuts of meat, and is the starting point for making soups and stews. Broth is a clear, flavorful liquid made by simmering meat or poultry and other ingredients. Broth is generally seasoned, whereas stock is not. Caramelization is a culinary phenomenon that occurs when carbohydrates like sugar are heated to temperatures of 300 F or higher, causing them to turn brown. Deglazing a pan involves adding liquid, such as stock or wine, to loosen and dissolve food particles stuck to the bottom after cooking or searing. The flavorful mixture produced by deglazing can be used to make a sauce. Egg wash is a mixture of beaten eggs plus water or milk brushed on pastries and pies before baking to give them a golden, shiny glaze. Florentine refers to a dish that has been prepared in the style of the Italian region of Florence and characteristically featuring spinach. A grill is a piece of cooking equipment where the cooking surface consists of an open rack or grate with a heat source underneath. The heat source can be an open flame (either gas or charcoal) or electric. Herbs are any green or leafy part of a plant used for seasoning and flavoring a recipe, but not used as the main ingredient. Basil, parsley, rosemary, thyme, and dill are all herbs. Julienne is a basic knife cut measuring 1/8 inch × 1/8 inch × 2 1/2 inches, in the shape of a matchstick. 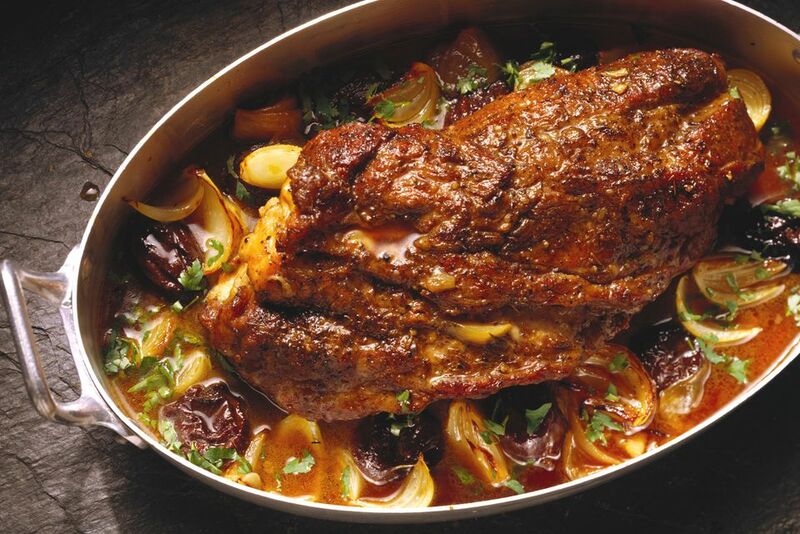 Jus is a word for the pan-drippings from roasted meat, which is generally enhanced by deglazing the pan with stock and simmering the liquid with other ingredients. Kneading refers to working dough by hand to develop the gluten in the flour. Kneading dough is what gives bread its texture and structure. A liaison is a mixture of egg yolks and heavy cream that is used to thicken a sauce. Mirepoix is a combination of chopped carrots, celery, and onions used to add flavor and aroma to stocks, sauces and soups. Poaching is a technique where food is cooked in liquid with a temperature ranging from 140 F to 180 F. It's typically reserved for cooking very delicate items like eggs and fish. Roux is a mixture of equal parts butter and flour which is cooked and then used as a thickener in sauces, soups, and stews. Sautéeing is a form of dry-heat cooking that uses a very hot pan and a small amount of fat to cook the foods like vegetables, meats, and seafoods very quickly. Sautéeing browns the food's surface as it cooks and develops complex flavors and aromas. Simmering is a culinary technique where food is cooked in liquid within a specific temperature range and with bubbles forming and gently rising to the surface but not at a full rolling boil. Spices are any dried part of a plant, other than the leaves, used for seasoning and flavoring a recipe, but not used as the main ingredient. Dried bark, roots, berries, seeds, twigs, or anything else that isn't the green leafy part, is considered a spice. Stock is a flavorful liquid made by simmering bones along with aromatics and other ingredients. Generally unseasoned, stock is the basis for making various sauces. The Temperature Danger Zone is the temperature range most conducive to the growth of harmful bacteria, between 41 F and 140 F. Keeping food either colder than 41 F or hotter than 140 F is one of the simplest ways to prevent food poisoning. Variously described as "savory," "meaty" or "earthy," umami is the fifth taste, along with sweet, salty, sour and bitter. It occurs in foods like mushrooms, aged parmesan cheese, and soy sauce. The flavor enhancer MSG imparts the umami flavor. Velouté is one of the five mother sauces of classical cuisine, consisting of stock (commonly chicken, veal or fish) thickened with roux. A well-done steak is defined as a steak that's been cooked to an interior temperature of 160 F or higher. A food additive derived from corn syrup which is used for thickening sauces, helping emulsions come together and stabilizing them once formed. A microscopic fungus that produces alcohol and CO2 gas after ingesting sugar. The gas is what produces the rise in breads, and the alcohol is what produces beer and wine. Zest is the outer layer of the skin of a citrus fruit which is often used to flavor desserts and drinks. What Are the 5 Mother Sauces of Classical Cuisine? How Can Science Help You Make Fluffy Pancakes?